Average annual return (CAGR) QSPIX, 4.85%, VFAIX (S&P 500 index fund) 11.30%. Total money made by a $10,000 investment since inception, QSPIX about $3,000, VFIAX about $7,000. That's not some technicality. Now when I've said things like that in past, IIRC posters (not you) have accused me of setting up a straw man. I believe people say that's a straw man whenever you do it...because it clearly is. Just finding a marketing blurb where AQR leave themselves open to that kind of straw man argument doesn't mean your aren't. With funds like this you are not concentrating your risk in market beta, you're taking little or none, though are taking other risks. But risks which have shown so far to in fact be nearly uncorrelated to stock market beta. They might not always be, and the return might also be higher or lower than it has been, but on the same basis that the fund has not kept up with the (US) stock market, which in fact no reasonable investor would use as the go/no go to evaluate the fund, it has achieved greater than bond return with low correlation to beta. I don't see a point in trying to find an esoteric benchmark for QSPIX that actually matched what it was trying to do in the mechanics. That would just tend to move the problem of evaluating it to understanding the specifics of the benchmark...and how in all likelihood it wasn't really a match for QSPIX. The US, or if one were less biased against it, global equity return is also clearly not the right benchmark. Nor is there any reason I can see to compare QSPIX's peformance in a given period to the return from taking significant duration risk. That leaves the 'risk free' return, like T-bills. But, it's then a benchmark the fund has to beat by a significant margin. Just the binary 'it beat it's benchmark' would be meaningless. Because obviously there is significant expected std dev of return albeit uncorrelated with beta, and an unknown risk factor (in the complexity and agency issues) which is reasonably presumed negligible with T-bills. But what the benchmark does gauge is how the fund has to do better if riskless rates are higher. My answer to the question 'what's good performance for this fund' would be something like 2% real return. Bonds are around 1% now, I believe the equity E[r] is maybe 3%-4% real, something well towards the middle with low correlation to beta would be OK, IMO. For whatever that's worth because projecting an expected return for this is much more difficult than stocks, for which E[r] is still a more ambiguous concept than high grade bonds. Whereas analyzing based on short term past realized returns is fraught, for anything. But I would say it has performed at least not that poorly inception to date, for what it is. S&P 500 rather than Total Stock was a bad choice--I think I was reacting to someone saying that "the S&P 500" was inappropriate, for something else, in a different topic, in another thread. I think you're right that VT is more appropriate than either Total Stock or the S&P 500, because, on inspection, I see that the stock component of QSPIX is 44.2% US. And, yes, it has not failed "dismally" compared to VT.
Last edited by nisiprius on Sat Nov 10, 2018 12:00 pm, edited 2 times in total. I believe people say that's a straw man whenever you do it...because it clearly is. I was quoting what Random Walker had said: "pre-tax equity-like expected return." Fine, then it doesn't have "equity-like expected return," it has "balanced-fund-like expected return." Morningstar chooses, "Morningstar Mod Tgt Risk," I haven't checked but I imagine that's close to 60/40, and it basically has been a tie since inception of QSPIX. I thought you were quoting AQR, but it just strengthens my point I think if you were quoting an individual not associated with them. Just because you can find one person saying 'equity like returns' doesn't mean it isn't a straw man to compare QSPIX to the stock market. It is a straw man, on the merits of a reasonable analysis IMO. The idea is to get away from total concentration on beta in some part of one's portfolio of risk assets. It would be great if that cost nothing in expected return v. stock market beta, but showing a history of under performing the stock market for such an investment then saying 'it's failed dismally'...is knocking over a straw man, IMO. It doesn't escape that characterization because somebody trying to argue in favor of the fund helped you set up the scarecrow. I think it’s fair to say the expected return is about 6-7%, equity like. But actual equity returns are rarely similar to the long term expected return. So I wouldn’t get too stuck on comparing the performance to a specific equity index, fund, or stock/bond portfolio over any given time frame. I’d look at its absolute returns, volatility, and correlations to stocks and bonds. If need to look backwards, I’d specifically do the following. Take your own portfolio, and decide what you want to accomplish with it: increase expected return and volatility to lesser extent, keep expected return about constant and decrease volatility. Decide where you would create a QSPIX position from within your own portfolio. Then look back and see what the effect on your own portfolio would have been with regard to return, SD, Sharpe. When I decided to create the alternative positions, I effectively decided to create my positions by taking from municipal bond allocation in taxable account. So I was hoping to get a post tax return greater than my bonds but likely less than the equities. I was hoping to increase portfolio expected return, increase risk to a lesser extent, improve Sharpe. Sort of like the Portfolio Visualizer exercise I posted above. I have only read a couple pages of this thread, but it seems like the goal of QSPIX is to provide equity-like returns with zero correlation to the market and limited volatility. It seems to me that the equity-like returns with limited volatility would be the main goals here. If it is somewhat correlated to the market, I assume that is not a deal breaker as long as the equity-like returns with limited volatility is happening. I’m sure the thought going through your mind right now after seeing the leveraged ETFs is, “what about volatility drag! ?” While that is true when buying and holding a single leveraged ETF, it is not as big of an issue when holding them as a diversified portfolio. TQQQ and TMF have only been around since 2011, so I developed my own proxy funds based on the Nasdaq index data and VUSTX daily data. I then performed a Backtest from Jan 1987. My results showed a 11% CAGR, 8.4% SD, -13.4% Max DD, 0.93 Sharpe, and 1.69 Sortino. Over that same time period, S&P 500 had 10.2% CAGR, 14.7% SD, -51% Max DD, 0.53 Sharpe, and 0.76 Sortino. This fund would have had a 0.55 correlation compared to the zero correlation of QSPIX. So if that’s important to you, this idea may not be a good alternative. But overall, I would be hesitant to use QSPIX since it’s hard to understand how they invest the fund and it’s hard to determine if their methods will continue to work in the future. The challenge with that proposed portfolio is the need for frequent rebalancing. Say, you go through a period in which QQQ makes 11% a year for 5 years. Your TQQQ will grow significantly in value, slowly becoming more than 10%, 20%, 30%, 40%, 50%, 60% of your portfolio. At what point do you rebalance? Rebalancing a 2-asset portfolio like US.Total.Stock.Market+BND is already hard enough (with what pre-tax, ROTH, and post-tax funds, and various tax-efficiency objectives). My Backtest is based on rebalancing once per year, at the beginning of each year, back to the original allocations. So if you are in a taxable account, you would pay long term capital gains on whatever portion you have to sell to reset allocations. Then you would also pay ordinary tax on dividends from the bond funds. Here’s a good response. Not my own, it’s an example from Larry Swedroe. He like Matjen above, thinks a 60/40 portfolio is a reasonable yardstick. The rationale is should compare investments with similar volatilities. QSPIX has an expected volatility of about 10. Stocks have vol about 20% and intermediate bonds about 5%. So expected volatility of 60/40 portfolio also about 10. The whole story isn’t just in the comparison in isolation though. It’s the diversification benefit this fund provides to the portfolio already dominated by stocks and bonds. If at first you try and don't succeed, blame the Value premium! Works for me. I then performed a Backtest from Jan 1987. My results showed a 11% CAGR, 8.4% SD, -13.4% Max DD, 0.93 Sharpe, and 1.69 Sortino. Over that same time period, S&P 500 had 10.2% CAGR, 14.7% SD, -51% Max DD, 0.53 Sharpe, and 0.76 Sortino. This fund would have had a 0.55 correlation compared to the zero correlation of QSPIX. 1) back test results of risk parity-ish ideas with significant bond duration since the 1980's is somewhat subject to long term bond bull market in that period. Not that it invalidates your idea, especially since it isn't as duration-ish as some broadly similar ideas. 2) In a similar vein but maybe more obvious, the Nasdaq isn't just 'higher beta stock market' it's a fairly narrow industry/country slice of stocks. What if China runs the US out of its position as tech leader over the next 20 yrs? You would still not do terribly because only 21% Q's and 119% fairly low risk, but it's kind of a narrow bet for future upside v known history of the Q's in the age where modern tech came to be, with US firms leading. 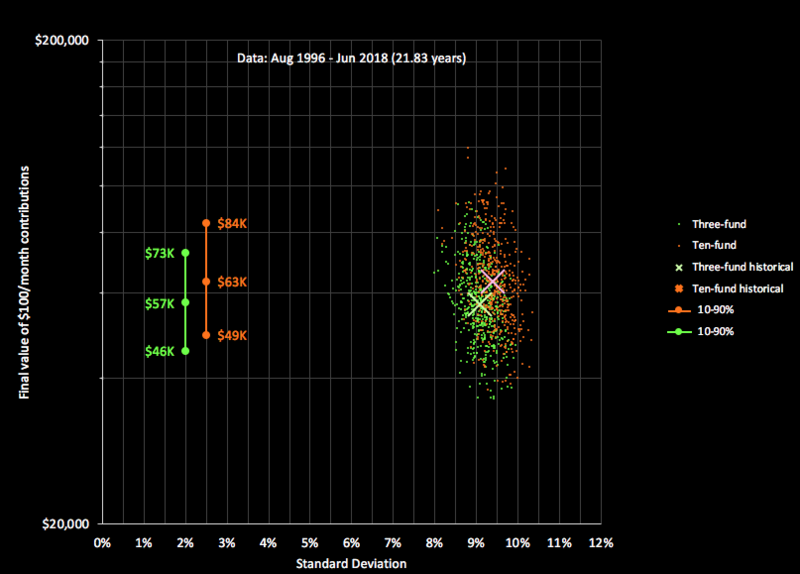 2) 55% v zeroish correlation to the stock market is a pretty big difference if somebody is largely stuck in a conventional portfolio by appreciated funds in taxable and is looking to diversify away from beta at the margin in a limited tax deferred space: then you really want that marginal add-on to have zero (if it can't be negative) correlation to beta. As opposed to a all tax deferred investor who could at least in theory disassemble and reconstruct their entire portfolio along your lines at just current transactions costs. I generally agree with all your comments. The main idea I was trying to get across was the fact that you can hold 80% of your fund in something that gets you close to a risk free return and guarantee that you will never have a drawdown of more than 20% at any time. Then, with the 20% of your funds that are actually at risk, put them in a blend of diversified blend of leveraged index funds. You can make that blend whatever you want. So to your point, you could sub out nasdaq with perhaps a blend of s&p 500 3x (UPRO), Mid cap 3x (UMDD), Russel 2000 3x (URTY), International Developed Markets 3x (DZK), etc. based on whatever you think would be an optimal equity blend going forward. But I would still keep the leveraged bond portion in long term treasury. Wow. 3 years, 1400+ posts of extensive discussion, not including other smaller threads. Never seen any active fund got this kind of attention any where. I think it’s fair to say the expected return is about 6-7%, equity like. But actual equity returns are rarely similar to the long term expected return. So I wouldn’t get too stuck on comparing the performance to a specific equity index, fund, or stock/bond portfolio over any given time frame. Agreed, actual returns for stocks too noisy. If anything it would be slightly more sensible to just look at returns above risk-free rate and compare that with what you think equity-like returns above risk-free rate should be. Using actual stock returns over the period just introduces additional noise. That is, unless the point of the analysis is just to understand what would have been better over the past period, and you're not trying to make any kind of generalized conclusions. It's been closed to new investors for a while now. Though if performance keeps up, maybe it can reopen soon enough. There's a similar Alternative Risk Premia Fund that overlaps a lot in strategies and assets, also with a long/short, market neutral (on average and close to it for any given snapshot) approach. Tickers QRPIX / QRPRX / QRPNX for I/R6/N shares. That fund doesn't trade in the lower-capacity markets that Style Premia covers such as the commodities futures and rates, but adds trend and volatility strategies to the value / momentum / carry / defensive used by the older fund. choosing investments or investment strategies based on a thread being active/controversial on this forum hasn't always worked out in the past. if you haven't read it already (or parts of it) you might be interested in this thread. It doesn't end well. "A different approach to asset allocation"
There are some sizable declines across the board in the stock market today. I'll be interested see if QSPIX will be up for the third day in a row. Good point, Dave. On bad days when the market is tanking, alternates tend to outperform and reduce portfolio volatility. However in the US and most other countries as well, the long term trend of the market is not down but up and markedly so over long time frames. Adding alternates may provide diversification in market down-cycles but it comes at the cost of decreased long term expected return. Most of the time the market is going up, not down, so adding non-market exposure tends to underperform. The question is how much does volatility bother the individual investor? Is modestly decreased portfolio volatility in market corrections/bear markets worth the long term reduced returns in bull markets? Alternates tend to perform as equity/bond hybrids in terms of risk/return. Similar results can be achieved by adjusting the equity/bond mix of simpler portfolios without the increased cost/complexity that alternates inevitably incur. For some investors, the reduced portfolio volatility from alternates is clearly worth what you pay for it in increased costs and reduced expected long term returns. For me, it's not. Similar results can be achieved by adjusting the equity/bond mix of simpler portfolios without the increased cost/complexity that alternates inevitably incur. 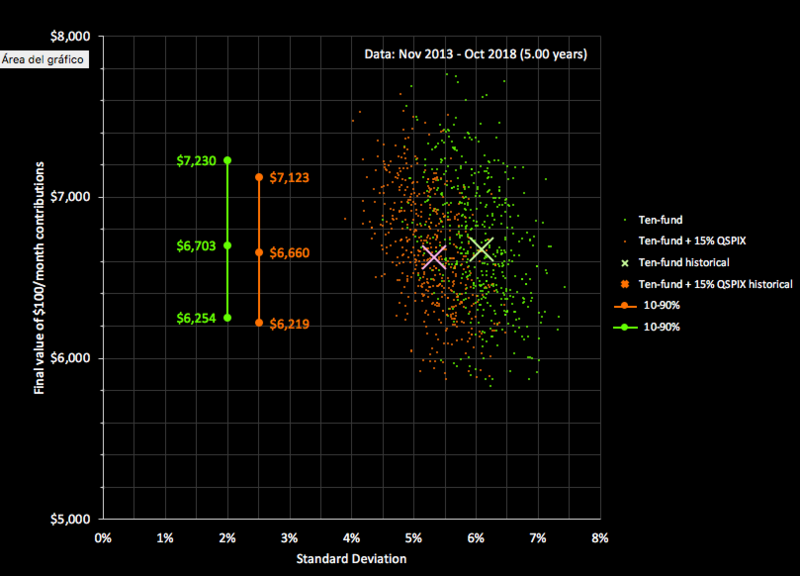 Virtually any backtest in Portfolio Visualizer over the life of QSPIX (Nov 2013 thru Oct 2018) will produce a slightly higher CAGR at a nearly identical SD when you compare a TSM/TBM to TSM/TBM/QSPIX portfolio. This is true over a wide range of TSM/TBM proportions (I checked from 20:80 to 80:20). FWIW, my simple test cases, aimed at yielding the same volatility between the portfolios, reduced the TBM exposure by ~ 15% and replaced it with QSPIX. (I realize that some prefer to take their QSPIX allocation 50/50 from stock/bond, but doing so in a backtest inhibits a credible oranges:oranges comparison since both CAGR and SD are changing simultaneously, hence my approach above). I'm not suggesting this is any proof of outperformance in the future, and readily acknowledge that backtesting isn't proof of future behavior. But it is something. Along with other data (that the risks targeted by QSPIX do have an associated premia, that AQR can capture meaningful amounts of the premia after costs), some Bogleheads reasonably expect a portfolio w/ QSPIX has a higher probability of producing a nominally higher CAGR than a same-SD portfolio without it. You state the opposite, but I don't see actual evidence to support. Its interesting that you suggest that QSPIX helps more in a downward market, and hurts in an upward market. Well, the backtest above, aka the life of QSPIX 11/13-10/18, is inarguably an upward market. So by your own perspective, that "arbitrary" time window should support your point, yet it refutes it. I happen to share your expectation that any QSPIX benefit should be greater in a bear market than bull. Unfortunately we don't have data to compare the portfolios over a downward trending TSM period of any reasonable timeframe. Perhaps the near future may provide such an example, who knows. I don't think that anyone is going to be able to convince any of the nay sayers that liquid alternatives deserve a place in their portfolios. I personally do believe that it is beneficial long term to have these in my portfolio, so I am going to maintain a allocation to them from here on out. Once I separate from the Military, I will likely move a great deal of money from my TSP account and will use a portion of it to invest in some other liquid alternatives. Once I separate from the Military, I will likely move a great deal of money from my TSP account and will use a portion of it to invest in some other liquid alternatives. Be in no hurry to move "a great deal of money from my TSP account." The TSP funds are among the best and lowest cost funds in the industry. But I'm not going to take everything out of the TSP. Even after the TSP Modernization Act, there are certain things that the TSP doesn't offer and has no plan to that I intend to use, such as in plan Roth conversions. I do intend to keep my costs low however, so please don't be too concerned. Five years of under performance: "You can't judge the strategy on just 5 years of results"
Three days of over performance: "See the strategy is working!" Three day streak ends: "Nothing to see here"
How exactly do you define underperformance? The 5 year history is 4.85% CAGR with 0.04 correlation to the US stock market. Whats not to like about that? Sure, we'd all prefer a CAGR in the 6-7% range, but even when "underperforming" that expectation, QSPIX has been a far better portfolio component than any typical bond fund for the time period you are highlighting. Last edited by InertiaMan on Wed Nov 14, 2018 12:49 pm, edited 1 time in total. How exactly do you define underperformance? The 5 year history is 4.85% CAGR with 0.04 correlation to the US stock market. Whats not to like about that? Sure, we'd all prefer a CAGR in the 6-7% range, but even when "underperforming" that expectation, QSPIX has been a far batter portfolio component than any typical bond fund for the time period you are highlighting. Well, sure if you move the goal posts. What happened to all the "Equity like expected return, with half the volitility" talk? This statement is incorrect and misleading. 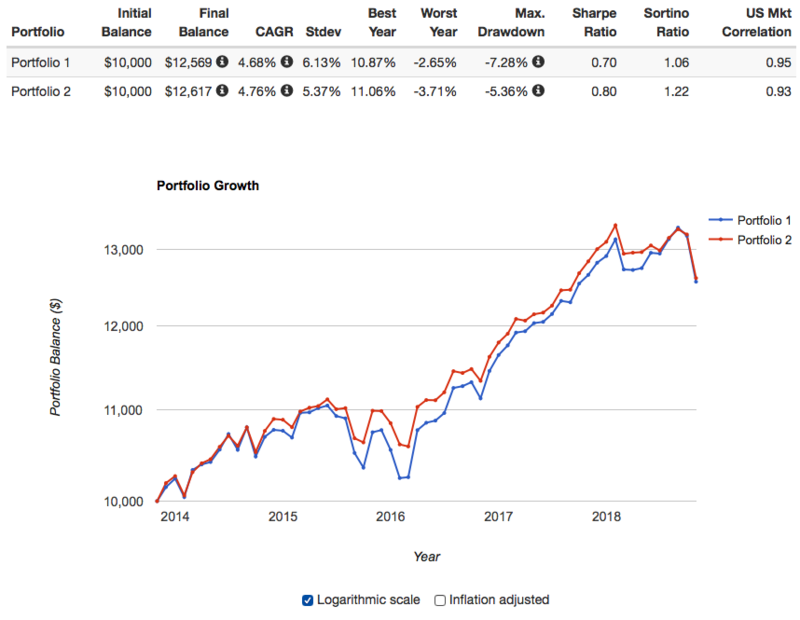 According to Morningstar, VBIAX, Vanguard's Balanced Index fund (expense ratio 0.07%) has outperformed QSPIX (expense ratio 2.33%) YTD, I YR, 3 YR, and since QSPIX's inception almost 5 years ago. So over its complete lifetime, QSPIX which cost 33 times more per year in expense ratio than the Vanguard Balanced Index Fund, managed to have a much lower CAGR, a higher standard deviation, over twice as high a maximal drawdown, and, consequently, a massively lower Sharpe ratio than plain old simple cheap Vanguard Balanced index Fund which is a 60/40 US stock/bond index fund. You take on more risk, you get more volatility, lower returns, more than twice the losses in maximal drawdown, vastly less return per unit of risk and, yet, you pay 33 times more for the privilege of owning it. Given these numbers, please explain to me the appeal of QSPIX which in theory is diversification. It is important to remember that flushing cash down a toilet also provides diversification to an equity/bond portfolio but like QSPIX the diversification is all in the wrong direction. Moving goalposts? I used the very goalposts you used in your earlier post. "equity-like" is a subjective term, but I don't think its unreasonable to consider ~ 5% to be in the range of equity asset classes. Especially if you consider that the time window being applied includes the worst sustained period in the entire history of the fund (Feb-Oct this year). If you really want to move goalposts, the CAGR for the life of the fund thru January was 8.74%. For all the naysayers, let me help you: highlight the past 9 months performance, and speculate that this unpleasant downsloping curve will continue consistently in the future, due to some fatal flaw of fund construction that is being exploited by frontrunning of more sophisticated hedge funds. Two years from now, when the 5 year CAGR goes negative, you can chastise QSPIX proponents and celebrate their losses. My statement was neither incorrect nor misleading. I compared two portfolios: TSM/TBM versus TSM/TBM/QSPIX. I did so for five different proportions of stock/bond (80/20, 60/40, 50/50, 40/60 and 20/80). I then set the QSPIX amount in the alternative portfolio to replace approx. 15-18% of the bond allocation (roughly 4%, 6%, 8%, 10%, 14% into above list; I can't recall exactly because I iterated to achieve matching SD). I chose that approach in an effort to produce near-identical SD for any two portfolios being compared. My generalizations in my post above are an accurate description of the outcomes. You, in contrast, are simply comparing a balanced fund in isolation to the QSPIX fund in isolation. No one here is suggesting that a portfolio be constructed solely with QSPIX, rather than a balance of stocks/bonds. That is what your comparison is evaluating. You missed Inertia Man’s point. It’s not TSM/TBM v. QSPIX, it’s what adding QSPIX to a TSM/TBM portfolio does to the portfolio as a whole. My comment about moving goal posts was not about the time frame, but rather your comparison to bond returns. It seems whenever people want to sing the virtues of these type of funds the mantra is always "expected equity like returns" with either lower volatility and/or low correlation. But, whenever the issue turns to evaluating their performance relative to expectations, the argument becomes "you can't compare to equities", "they are their own benchmark", or as you did above, "look, they performed better than bonds". I did not mean to turn this into another argument about how to benchmark these funds. The point I was trying to make, somewhat in jest, was the seeming contradiction between people making the argument that you need to be patient with these types of investments, rather than judge them on such short track records, then turning around and crowing about how they did well the last 3 days. I did not compare QSPIX to bond returns. I compared portfolios w/ and w/o QSPIX. I took the QSPIX allocation from the bond side, simply because that is the only way to hold SD/volatility constant, and produce a reasonable oranges:oranges comparison. I also don't perceive the highlighting of daily performance to be crowing about how well QSPIX did. Very few (perhaps none?) people on these forums are naive enough to consider daily returns as representative of performance. I believe the highlighting of a daily #'s was intended to illustrate the lack of correlation. This debate is getting old. If you don't believe in factor investing you don't believe in it. What else is there to say? I like to learn about new strategies, products, how people are using funds, and alternate viewpoints. What I see over and over: homespun wisdom, emotional appeals, cherry picked and inappropriate data/comparisons, name calling (asset gatherers ,etc.). It gets tiresome and derails what could be productive conversations. Maybe there should be a separate forum for those interested in factor investing. I like debating people with contrary positions but I don't see what I can learn from most of these posts: everyone who isn't Bogle is a crook? It could be I need to find another community. Where's Larry hanging out these days? SP.500 is up around 3 or 5% for the year, and AQR funds are down 10-12%. Under what circumstances would you expect QSPIX to shine? It’s been said multiple times on the thread. I’d expect it to do well when the factors it tracks do well and that those factors would be mostly uncorrelated to the market. Maybe there should be a separate forum for those interested in factor investing. I too have suggested a separate subforum here for these types of discussion. Yes, I'm interested in where Larry is as well. He was an early proponent of QSPIX if not the person who introduced it to this board. For me, there is a problem with having a separate factor forum. There is an infinite spectrum of portfolio possibilities, ranging from simple lowest cost TSM to complex, expensive, advisor, factors, alts. What is interesting to me is the trade offs an investor has to decide on in designing his portfolio. There are trade offs between expenses and improved portfolio efficiency. Having two separate forums may well limit the discussions covering the intersection of the differing philosophies. Random Walker wrote: There are trade offs between expenses and improved portfolio efficiency. I have thought this over a great deal, there is a case for Alt funds but so far it has not been strong enough for me. Of course there are trade offs. There always are. Portfolio efficiency is not worth pursuing at any cost, obviously, but it is definitely worth something. I completely agree that costs are crucial. But a less efficient portfolio has some cost associated with it as well. Isn’t the expense ratio of Total International Stock Index a little higher than Total US Stock Market Index? Why take on the additional cost of adding the international fund? I think the answer is that you take on the slightly increased expense for the diversification benefit. You have decided that the increased diversification benefit of adding international is worth some additional cost. You have made an asset allocation based on the trade offs involved. I agree that an investor can’t go wrong using expenses as his first guide to making investment decisions. It’s not only extremely important to look at expense ratio, but it’s also very easy. We need to broadly think about other costs that are not nearly as easy to know or estimate: taxes, trading costs, behavioral errors, variance drain. Let's explore this. Let's grant that to date, QSPIX has, in fact, had returns that have not been "equity-like" but can be fairly described as "60/40-like. And it has in fact had low correlation with both stocks and bonds. For our example of a traditional balanced portfolio, I will use this one, because it incorporate a typical factor-aware allocation as understood circa 1998. For the effect of adding QSPIX, I chose to use a 15% allocation to QSPIX because a tiny allocation could only move the needle a tiny amount. I'm not sure what is considered a realistic allocation by those who use QSPIX. I made all the other portfolio allocations 85% of what they had been, so portfolio 2 is "85% portfolio 1, 15% QSPIX." During this time frame, by the way, QSPIX averaged a 4.85% return; Portfolio 1, 4.68%; Total Stock, 10.67%. So, during its lifetime, QSPIX has not had "equity-like" returns but has indeed had "60/40-like returns." Here are the comparative growth charts and PV statistics for the two. It's a Rorschach test. I say it hasn't mattered much. A QSPIX advocate might say, accurately, that it did increase the return slightly, it cut the risk measures slightly, and overall it increased the Sharpe ratio, so it was an improvement. Here's a "matter-scatter" chart. (No, the portfolios did not lose money; this is not a "growth of $10,000" chart, this is based on "$100/month" contributions, so a zero-return holding would have a final value of 60 months x $100 = $6,000). The difference in portfolio final value was small compared to the simulated spread of possible results. It also happens that for some reason, in the "cumulative contribution" case, adding QSPIX actually happened to reduce the final total rather than increase it. Part 1: Introduction, Appendix: Methodology Brief notes: 1) In these Monte Carlo simulations, the return for a given month is varied by randomly choosing the actual historical return or the actual historic return for an adjacent month. 2) They show the final value from $100 monthly contributions made over the whole time period. 4) Green and red crosses mark actual historical values. 5) Green and red bars show the 10% percentile, median, and 90% percentile of the range of outcomes. 5) The actual data source is PortfolioVisualizer.com, Backtest Portfolio, Monthly Returns; this is used as calculation input; and no PV content or numeric values are directly reproduced. Last edited by nisiprius on Fri Nov 16, 2018 2:56 pm, edited 1 time in total. What’s the timeframe on that, since the inception of QSPIX? Certainly the improvements to a portfolio are incremental, not revolutionary. But as you said improvement nonetheless. I can see why most everyone looking at the chart might think adding that one fund is not worth it. That brings up the question of adding multiple incremental potential improvements to a portfolio. Of course you already did a lot of that in your example with international, value, size. But many smallsteps that each yields modest incremental improvement can potentially result in big portfolio improvement. The test is to start with a two fund TSM/TBM portfolio and then add international and EM, tilt heavy to size and value, add screens for momentum and profitability to equities, increase quality and shorten duration bonds, then add style premia and possibly other alts. Then see how portfolio affected by multiple incremental changes. What’s the timeframe on that, since the inception of QSPIX? Certainly the improvements to a portfolio are incremental, not revolutionary. But as you said improvement nonetheless. I can see why most everyone looking at the chart might think adding that one fund is not worth it. That brings up the question of adding multiple incremental potential improvements to a portfolio. Of course you already did a lot of that in your example with international, value, size. But many smallsteps that each yields modest incremental improvement can potentially result in big portfolio improvement. The test is to start with a two fund TSM/TBM portfolio and then add international and EM, tilt heavy to size and value, add screens for momentum and profitability to equities, increase quality and shorten duration bonds, then add style premia and possibly other alts. Then see how portfolio affected by multiple incremental changes. I sort of did that in another posting, but without QSPIX:Small-cap value and the "ten-fund portfolio." Here's the part comparing a three-fund portfolio with a ten-fund portfolio supposedly incorporating successive layers of incremental improvement. First, three-fund versus ten-fund, (and I think it speaks very favorably for factor advocates that these portfolios were put down on paper and advocated well before 2000-2002, a time when several diversifiers performed very well in comparison to the total market or large-caps). It's a Rorschach test. I say it hasn't mattered much. A QSPIX advocate might say, accurately, that it did the return slightly, it cut the risk measures slightly, and overall it increased the Sharpe ratio, so it was an improvement. I agree Nisi. A 5%-15% position in a fund that combines qualities of bonds and equities and where many take the funding from both sides will not make much of a difference in total return and it will certainly be noisy in a short time period. I agree, however, I also increase my allocation to alternatives vice equities the further along in my glide path that I am. So, it will definitely play a greater role in my portfolio over time vice someone who has a static allocation.